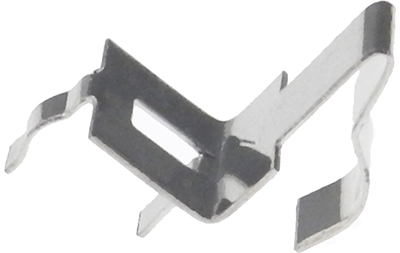 Begoun, Inc., a provider of precision metal forming, was contracted by a manufacturer of cable television components in Georgia to produce a hybrid grounding clip. Begoun decided that the clip, composed of beryllium copper, would require production by means of a precision fourslide stamping process in order to produce the intricate bending requirements of the part. The customer-supplied print specified a thickness of.010", as well as a bright acid tin plating. A quantity of 625,000 of these parts were produced, put into stock in Begoun's warehouse and shipped out monthly to their customer. For more on this custom spring coiling project, see the table below or contact Begoun directly. Product Description This beryllium copper clip is used in a cable TV application. Overall Part Dimensions Material Thickness: .010"